Fire resistant hydraulic fluid is a type of hydraulic fluid, which has significantly higher combustion temperature. Therefore, it is more fire resistant compared to mineral oils. Petroleum-based hydraulic fluids are not suitable for usage in several applications due to their high flammability. Petroleum-based fluids are not used in applications where the hydraulic system operates or is located near open flames or hot surfaces, as open flames or hot surfaces can act as a source of ignition of these fluids due to high flammability. This can result in large-scale industrial fire. Fire resistant hydraulic fluids are ideal for usage in such applications. Certain applications such as die casting operations and presses or continuous casting hydraulics, which are placed near ovens in steel mills, are ideal examples of applications of fire resistant hydraulic fluids. Variables such as overall system performance, costs, and stability of fluids need to be considered during the selection of fire resistant hydraulic fluids. Furthermore, selection of the right fire resistant hydraulic fluid can often lead to a compromise between the hydraulic fluid performance characteristics and system needs, which can minimize costs as well as maximize health and safety benefits at the same time. Rise in concerns about worker safety and industrial fires is the primary driver of the fire resistant hydraulic fluid market. Large number of major industrial fires have occurred in the past due to accidental spraying of flammable mineral oils over an ignition source. These industrial fires were not only costly, but also deadly; they claimed several lives. Industrial fires pose a threat to not only industrial equipment, but also to operators, workers, and the environment. It is important to select a hydraulic fluid based on safety and service life to minimize these losses and threat of industrial fires. Fire resistant hydraulic fluids can be used in application areas where mineral oils or petroleum-based hydraulic fluids cannot be used. Thus, increase in concerns about worker safety is expected to drive the fire resistant hydraulic fluid market. Rise in industrialization and increase in demand for these fluids in the aviation sector are also anticipated to drive the fire resistant hydraulic fluid market during the forecast period. Significant increase in industrialization and rise in demand for fire resistant hydraulic fluids in the metal processing industry are estimated to boost the market in the near future. Expansion in the aviation industry is also projected to play a key role in the growth of the fire resistant hydraulic fluid market. Higher prices of fire resistant hydraulic fluids vis-à-vis conventional petroleum-based hydraulic fluids is a major restraint of the market. In general, prices of fire resistant hydraulic fluids vary in relation to the prices of petroleum-based hydraulic fluids. However, fire resistant hydraulic fluids are used in critical application areas wherein petroleum-based hydraulic fluids cannot be employed due to flammability issues. However, selection of fire resistant hydraulic fluids could be a tradeoff between performance characteristics and cost economics. Rise in environmental concerns and increase in number of regulations regarding pollution control have compelled manufacturers to seek innovative and sustainable ways to manufacture and produce environmentally-friendly products. One such innovative way is the manufacture of bio-based fire resistant hydraulic fluids, which are less polluting while offering the same performance characteristics as that of fire resistant hydraulic fluids. This is likely to offer a new opportunity to fire resistant hydraulic fluid manufacturers to achieve sustainable growth in the market. Based on region, the fire resistant hydraulic fluid market can be divided into North America, Latin America, Europe, Asia Pacific, and Middle East & Africa. Asia Pacific dominated the global fire resistant hydraulic fluid market in 2017. This can be primarily ascribed to the rise in demand for these fluids in various application areas in the region, especially in China. The region is the global leader in steel production and mining output. These are the key application areas of fire resistant hydraulic fluids. Furthermore, the market in Asia Pacific is anticipated to expand at a significant pace during the forecast period, primarily due to the rise in demand for fire resistant hydraulic fluids in developing countries in the region, especially in China and India. Key players operating in the global fire resistant hydraulic fluid market are Exxon Mobil Corporation, BASF SE, Castrol Limited, American Chemical Technologies, Inc., The Dow Chemical Company, Quaker Chemical Corporation, Southwestern Petroleum Corporation, Eastman Chemical Company, Total, Houghton International Inc., SINOPEC, MORESCO Corporation, and Idemitsu. Fire resistant hydraulic fluid is a type of hydraulic fluid with high fire resistant property and high combustion temperature vis-à-vis mineral oils. Certain applications such as die casting or hydraulic presses which are generally performed near an ignition source for petroleum-based hydraulic fluids such as open flames or hot surfaces can lead to a potential disaster. In order to avoid such situations, petroleum-based hydraulic fluids are replaced with fire resistant hydraulic fluids due to their inherently high fire resistant property. Several factors are considered while selecting a fire resistant hydraulic fluid. These include cost economics, overall system performance, performance characteristics, and stability of the fluid. Increase in concerns about worker safety and rise in awareness about industrial fires are expected to drive the fire resistant hydraulic fluid market. These fluids can minimize costly and deadly industrial fire accidents, which are usually caused by mineral oils catching fire from an ignition source. Rapid industrialization and rise in demand for these fluids in the aviation industry are also key drivers of the fire resistant hydraulic fluid market. Increase in industrialization, especially in developing countries, is projected to boost the fire resistant hydraulic fluid market owing to the rise in demand for these fluids in the metal processing industry. Growth in the aviation industry is anticipated to propel the demand for these fluids during the forecast period. However, higher prices of fire resistant hydraulic fluids is likely to hamper the market. This report analyzes and forecasts the market for fire resistant hydraulic fluid at the global and regional level. The market has been forecast based on volume (kilo tons) and value (US$ Mn) from 2018 to 2026, considering 2017 as the base year. The study includes drivers and restraints of the global fire resistant hydraulic fluid market. It also covers impact of these drivers and restraints on demand for fire resistant hydraulic fluid during the forecast period. The report also highlights opportunities in the fire resistant hydraulic fluid market at the global and regional level. The report includes detailed value chain analysis, which provides a comprehensive view of the global fire resistant hydraulic fluid market. Porter’s Five Forces model for the fire resistant hydraulic fluid market has also been included to help understand the competitive landscape in the market. The study encompasses market attractiveness analysis, wherein product type and application are benchmarked based on their market size, growth rate, and general attractiveness. 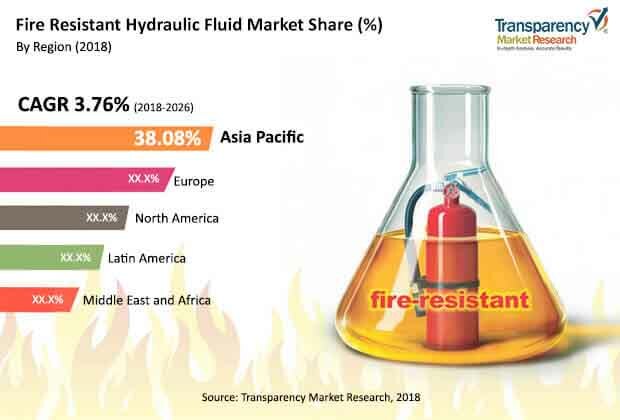 The study provides a decisive view of the global fire resistant hydraulic fluid market by segmenting it in terms of product type and application. In terms of product type, the fire resistant hydraulic fluid market can be classified into water-based (oil-in-water emulsions (ISO HFA), water-in-oil emulsions (ISO HFB), and water glycol fluids (ISO HFC)) and anhydrous-based (phosphate esters (ISO HFDR), PAG, and polyol esters). In terms of application, the market can be divided into metal processing, aviation, marine, mining, and others. These segments have been analyzed based on present and future trends. Regional segmentation includes current and forecast demand for fire resistant hydraulic fluid in North America, Europe, Asia Pacific, Latin America, and Middle East & Africa. The report provides the actual market size of fire resistant hydraulic fluid for 2017 and estimated market size for 2018 with forecast for the next eight years. The global market for fire resistant hydraulic fluid has been provided in terms of revenue. Market volume has been defined in kilo tons, while revenue has been provided in US$ Mn. Market numbers have been estimated based on product type and application of fire resistant hydraulic fluid. Market size has been provided in terms of global, regional, and country level markets. The report comprises profiles of major companies operating in the global fire resistant hydraulic fluid market. Key players are Exxon Mobil Corporation, BASF SE, Castrol Limited, American Chemical Technologies, Inc., The Dow Chemical Company, Quaker Chemical Corporation, Southwestern Petroleum Corporation, Eastman Chemical Company, Total, Houghton International Inc., SINOPEC, MORESCO Corporation, and Idemitsu. Market players have been profiled in terms of attributes such as company overview, financial overview, business strategies, regional presence, and recent developments.